While India has long been known for gender bias, female feticide, and other gender related issues, it is interesting to note that women played an important, indeed a dominant role, in ancient India. This is amply reflected in Indian mythology, Vedas, and epics. From Lopamudra and Maitreyi in Rig Veda to Sita in Ramayana, and Draupadi, Kunti, and Gandhari in Mahabharata: the females of ancient India have been portrayed as intelligent, sensitive, kind, headstrong, decisive, and venerable, the very qualities that define today's women! 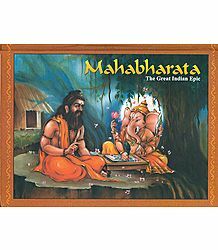 Mahabharata, one of the longest epic poems ever written, offers great insight not only into the great war that took place in Kurukshetra between the Pandava and Kaurava princes some five thousand years ago and the events leading up to it, it also gives one a sneak peek into the Vedic society and the role women played in it. Let's take a look at the two matriarchs of Mahabharata: Kunti and Gandhari, two powerful women who influenced the turn of events in the epic. Kunti, daughter of King Sura and adopted by king Kuntibhoja, was Krishna's paternal aunt. A young girl; devoted to the service of gods, sages, and guests, Kunti so pleased the sage Durvasa that he taught her a mantra that enabled her to invoke any god of her choice and have a son born out of him. Though still unwed, a curious Kunti could not resist the temptation to try out her newly learned mantra, and invoked Surya - the Sun God, and lo and behold, Surya appeared and blessed her with a son, Karna. Now, this illegitimate child was embarrassing for Kunti as she was not married yet and she took the heartbreaking, yet bold decision to set her newborn afloat in a basket in a river. Not even in her wildest dreams could Kunti have imagined then that her first born, left to fend for himself at birth, will one day become the arch enemy of her other sons that she so loved! Soon, Kunti's father held a swayamvar for her where she chose the King of Hastinapur, Pandu, as her husband. Sometime later, Pandu married the extremely attractive Madri. Kunti may not have liked this turn of events, but she and Madri soon became best of friends not knowing that very soon Kunti would have to bring up Madri's sons as her own. 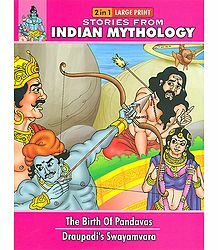 One day Pandu shot an arrow at the couple sage Kindana and his wife while hunting, taking them to be a deer due to their copulating forms and the dying sage cursed Pandu that he would die as soon as he tried to make love with either of his wives - Kunti or Madri. This curse so affected an as yet childless Pandu that he decided to go off to the forest to serve penance leaving the kingdom in care of his blind elder brother Dhritrashtra. While in the forest, Pandu became worried and depressed about dying without leaving any son to take forward his name and shared his despair with his wife Kunti, who along with Madri, had accompanied Pandu to the forest. At this point, Kunti was reminded of the mantra taught to her by Sage Durvasa and she used it reluctantly to invoke Dharma, Vayu and Indra gods who gave her three sons Yudhisthir, Bheem and Arjun respectively. 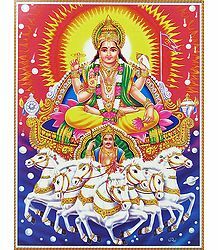 Kunti then taught the mantra to Madri who invoked the celestial physician brothers Ashwini Kumaras who blessed her with two sons Nakul and Sehdev. Some time later, Pandu died as a result of the curse as he was unable to resist himself from approaching Madri and a guilt laden Madri gave her life by jumping in her husband's funeral pyre. Kunti wished to do the same; however, she was advised by the sages to carry out her maternal responsibility of bringing up the five Pandava princes who were very young at the time. This marked the beginning of a lifelong duty that Kunti fulfilled with all her heart, leaving no stone unturned to ensure the princes got the right education, learnt the right values, and got their due as the rightful heirs to the throne of Hastinapur. Of course, the journey was a long and painful one that saw the mother and her sons living in the shadow of the caretaker turned king Dhritrashtra and his wife Gandhari and their hundred willful and bullying sons. Kunti, advised by the wise Vidur, understood the need to stay calm and humble while her children were growing up and wait for the right time before bringing up the issue of the future king of Hastinapur and the inheritance of her children. These years were bittersweet for the Pandava family as while on one hand they were marked by the love, generosity and guidance shown to them by Bhishma, the great grandfather of the princes, on the other hand they were marred by the small injustices of Dhritrashtra and the jealousy and dangerous pranks of Kaurava princes. And throughout this period, the person who stood out for her patience and perseverance was the widowed Kunti who single mindedly brought up her sons in a manner befitting Kshatriya dharma. 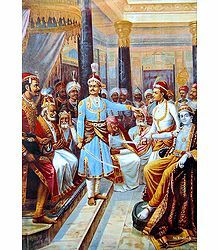 Soon, the princes were young and the eldest of the Kaurava princes, Duryodhana, started getting worried about the rising popularity of the Pandava princes' valor, kindness and wisdom. Yudhisthir, the eldest of the Pandavas was a wise and just prince and was accepted by both the palace elders and the people of Hastinapur as the king-in-waiting. Duryodhana resented this fact and kept up the emotional blackmail to his blind father for overlooking his own son and preferring his cousin for the throne while at the same time, he plotted with his maternal uncle Shakuni to kill the Pandavas. His constant efforts to his corrupt his father, who secretly loved his son the most and wanted him to become the king, came to fruition when Dhritrashtra agreed to send the Pandava brothers to Varnavata till they were called back by him. Duryodhan got a palace made of lac, a highly flammable material, for the Pandavas and hatched a plan to set fire to it when the Pandavas would be sleeping. 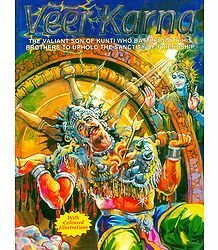 Fortunately, Vidur came to know of the plan and warned the brothers of the danger and made sure that while the palace was burning, Kunti and the brothers made their escape through an underground tunnel. This was the first exile of Pandavas in the forest where they stayed, without revealing their identity or announcing their escape to the world, till Draupadi's swayamvar. On hearing the news of swayamvar based on an archery contest, Arjun who was an ace archer participated in the contest and won Draupadi's hand in marriage. When Arjun and the brothers, who were living as hermits, took Draupadi to meet Kunti announcing they have something they want to show her, Kunti, who was busy with some work unknowingly said, “Whatever it is, divide it amongst yourself”. And the brothers, used to obeying their mother's every word decided to share Draupadi amongst them, and as such, each of the five princes married Draupadi who ended up with five husbands. This was one of the most controversial decisions taken by Kunti and Pandavas and many accuse Kunti of not apologizing and taking back her words when she finally came to know about the princess Draupadi. Then there are others who believe that Kunti did it to bind her five sons together even more firmly as she was wise enough to foresee the impending war and the need for all Pandavas to stay together to fight the enemy. While the beginning of the relationship between the two headstrong women - Kunti and Draupadi, may have been a bit awkward, to put it mildly, due to Kunti's insistence on getting Draupadi married to all her sons and not just Arjun, once the issue was settled and accepted by all to a certain degree, they lived with peace and understanding during the many years they spent together in exile in forest and later in Hastinapur and Indraprastha. They had many similarities in their character and which is probably why Kunti doted on her beautiful and wise-beyond-her-years daughter-in-law and Draupadi, in her turn, loved and respected her mother-in-law very much. Kunti wasn't much aggrieved at the loss of Indraprastha and the magical palace, that Maya built for their family, in gambling but her anguish and empathy at Draupadi's insult by Duryodhan and his brother Duhshasan led her to provoke her sons to fight for justice and revenge and claim their rightful inheritance even if it meant declaring war on close family and friends. A self-respecting women herself, the shaming of her daughter-in-law in full public view was something she could not forgive. The all-consuming love that Kunti had for her sons, the five Pandavas, made her blind to the totally unfair treatment that she meted out to her first-born Karna. While one does understand her reasons for giving up a son born out of wedlock, given the social stigma it carried, it is difficult to understand or justify her meeting Karna, on the eve of the great war to divulge the secret of his birth and when he refused to move to the Pandava army, to extract the promise of not killing the Pandava brothers. Karna promised to do so with the exception of sparing the life of Arjuna and asked Kunti to keep the secret intact until the end of the war. Like every wife and mother, Kunti wanted her brave husband's name and glory to be preserved and her sons to get their due. It pained her to see her sons and daughter-in-law living the life of hermits in forests and begging for alms when they were capable of doing so much more. While she did all she possibly could to convince Dhritrashtra and his sons to peacefully settle the matter, going to the extent of sending Krishna as Pandava's emissary to buy peace by accepting just five villages and foregoing the rest of the kingdom, it was not to be. This is when she asked her sons to prepare for war and fulfill their Kshatriya Dharma. However, when after the all-destroying war that lasted 18 days and killed all of the Kaurava princes and all sons of Pandavas leaving behind just twelve warriors from both sides, a grieving Kunti decided to accompany Dhritrashtra and Gandhari to forest sacrificing the comforts of the palace. When she was questioned by her sons on her decision, she explained that the war was fought to get them justice but now she needed to serve penance for all the violence leading to the deaths of so many kinsmen and thousands of others. Gandhari, the princess of Gandhar and a reincarnation of Mati - the Goddess of intelligence, was engaged to be married to Dhritrashtra, the eldest prince of Hastinapur. 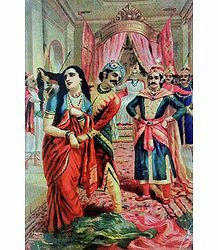 While Shakuni, her brother, was not pleased at the prospect of her sister being married to a blind prince who would not even be considered as the heir to the throne, the beautiful princess had her own notions of respect and loyalty to her future husband and when she came to know that he was blind by birth, she took a vow to blindfold herself for the rest of her life in order to show her empathy to him. While her action had a noble intent, many would argue that she would have been more useful to her husband if she had chosen to be his eyes instead of a blind companion. Gandhari's life could not have been easy, what with being married to a blind, insecure, and depressed prince. On top of that, Gandhari's only hope of ever getting her due by producing an heir to the throne was not materializing as per plans. With Pandu, Kunti and Madri in the forest, Gandhari and her husband wanted to have a son who would be the eldest of the Kuru princes and thus, eligible to become the king of Hastinapur. However, she had a prolonged pregnancy and in the mean time, Kunti and Madri begot sons through Durvasa's mantra. This event so upset Gandhari that she made her maids hit her stomach with an iron rod. This resulted in a lifeless ball of flesh coming out of her womb, which was later divided by Vyasa into hundred pieces and incubated in pots of ghee for two years to produce Gandhari's hundred sons and a daughter. Gandhari was a righteous woman who, despite knowing that her sons were weaker than her cousins, the Pandavas, and may not get the chance to rule the kingdom, never actively encouraged them to rile the Pandava brothers. On the contrary, she was wary of Duryodhana's constant endeavor to create trouble for Pandavas and hatch plots, along with his uncle Shakuni, to kill them. But her efforts to teach the right values to her sons were all in vain and she was well aware of her failure and rued it. The fact that she stuck to the virtue of righteousness is evident from the blessing that she gave her son Duryodhana before and during the Great War. Knowing well that dharma was on the side of Pandavas, she always told Duryodhana that may the victory be with those who are righteous! This does not take away anything from Gandhari, the mother, who opened her blindfold just once in her life to bestow a naked Duryodhana with an iron-body that could not be destroyed by any weapon. While on one hand she tried to save Duryodhana by giving her sound advice to call off the war and give half of the kingdom to the Pandavas and later by protecting him from harm through her powers, on the other she stayed true to herself and her righteous nature by wishing the victory for those who fought for truth. Even after the war, she forgave the Pandavas for killing her sons as she knew that they had tried their best to avoid the war and Duryodhan had tempted fate by insulting Krishna when he came to Hastinapur as an emissary of Pandavas. The relationship between these two matriarchs of the Kuru clan can at best be described as uneasy. While neither of them went out of her way to be mean or unpleasant to each other, their ever changing life situations did put them in awkward positions with regards to each other. To begin with, Gandhari was married to the older, yet blind prince who had no prospects to ever become a king. Kunti being married to Pandu, the king of Hastinapur naturally was in a more powerful position and had more say in palace and family matters, though she never put Gandhari down or took undue advantage of this fact. 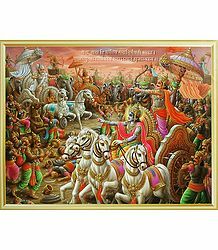 The tables turned when Pandu decided to leave for forest accompanied by his wives, leaving the reins of Hastinapur in the hands of Dhritrashtra for the duration. Gandhari became the queen and enjoyed, finally, an elevated position in the household. She also started nurturing a hope to produce an heir before Kunti did to ensure that her family's position of importance was maintained. When a widowed Kunti came back from the forest with her five sons, Gandhari was happy to show off her good fortune but bore her no ill will. On her part, Kunti had a huge task; that of bringing up her five children alone, in an environment made hostile by Gandhari's sons and brother and Dhritrashtra's hidden resentment. She concentrated on the same with advice and blessings from Bhishma and Vidur, without getting into the politics of the palace. In a way, she was a shrewd and far-thinking woman who knew that there is a time and a place for everything. After the war, Kunti was in a position of power again, however; she had no interest left in enjoying either her position or her power. She empathized with Gandhari who had lost all her sons and grieved alongside her for her own son Karna, whom she did not acknowledge for so long and did so in the end only to lose him to the war. When after fifteen years of the end of war, Dhritrashtra and Gandhari decided to leave for the forest to serve penance for not raising their children right and not doing enough to prevent the war that caused such a huge loss of lives, Kunti decided to accompany them. She wanted to serve them and take care of them and repent for her inability to forgive the Kauravas for their misdeeds which made her provoke her sons to wage the all-destructive war against their own kin. Both Kunti and Gandhari, in their own way, were women of substance. They were willing to undergo pain, sacrifice comfort and happiness, and stand up for what they felt was right. However, both of them were stubborn and impulsive and made certain decisions when young that they must have regretted in the later part of their lives. Kunti's biggest blunder was her immaculate conception of Karna out of wedlock and her subsequent decision to disown him and set him afloat. 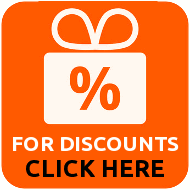 Later, keeping it a secret for too long and sharing it with Karna only at the last moment only worsened the situation. If she had revealed the truth earlier, Karna could have been convinced to exert influence on his friend Duryodhan and the war could have been averted. As for Gandhari, blindfolding herself was a total lack of farsightedness, pun intended. If she had been able to see what was happening around her and how her brother was poisoning the minds of her sons, she could have put a stop to it and instilled better values in them. Kunti and Gandhari set many examples of righteousness, whether it was following the destiny of their husbands, showing the right path to their children (though too late in Gandhari's case), or in their behavior at the end of the war while they stayed together first in Hastinapur, and later in the forest. However, they were human and had their weaknesses. They proved the saying hell hath no fury as a woman scorned true. Kunti led a checkered life and saw many ups and downs but the humiliation of her daughter-in-law Draupadi at the hands of cheating Kaurava brothers and in the presence of so-called keepers of dharma filled her with such wrath and a burning fire for revenge that she ensured her sons avenged her insult. Gandhari, while acknowledging the sins and fate of her sons, was so upset at the loss of their lives that she cursed Krishna with all her heart and power to certain doom along with his whole clan for using all tactics possible, and even deceit, to win the war. The two women were constantly aware of the right from wrong and always endeavored to follow the path of dharma, however; they were trapped in their life situations and had no choice but to live their destinies. And they did so with grace, dignity and showing unusual strength of character.